Welcome to your March propertybuyer market update. But where do you find these positively geared properties? Aren't they just located in the small outback mining towns? Well we are currently sourcing positively geared investment properties for our investor clients in western Sydney and consistently achieving yields of between 9% to 10%+. One of the keys to success with positive cash flow investing is that you have to do something to create the additional rental income. Positive cash flow opportunities are rarely advertised as an off the shelf type product. This is where the granny flat strategy comes in. By constructing a granny flat at the rear of an existing dwelling, it is possible to get two sources of income from the one property and turn a negatively geared investment into a positive cash flow property. 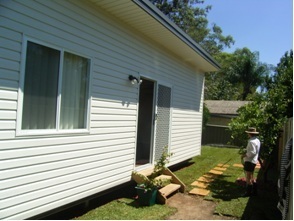 The state government is now permitting the installation of granny flats in residential areas to address housing shortages and improve affordability. Previously the NSW policy stated that the flat could only be used by a relative, but now it can be rented to anyone. So does this mean that you can stick a granny flat anywhere? No! There are still strict guidelines on what is permissible in terms of land size, set backs and the actual size of the granny flat. Investors need to understand these regulations and how they are applied or you risk buying a site that is unable to be developed. Planning approvals can be obtained in just 10 days if you have the right paperwork and compliance procedures in place. The maximum size of the flat is 60 square metres and you can't subdivide the existing property from the granny flat to sell separately (if would have to be sold as a complete package). How does it improve returns? The cost of construction of a granny flat can range from $70,000 to $140,000 or more depending on size, number of bedrooms and inclusions. The rental return on the flat ranges from $220pw to $350pw depending on the location and finishes (there's no point building a tiny two bed flat that won't rent out). This means investors can easily achieve a yield of 16% to 20%. Compare the granny flat strategy to buying standard investment property offering typical yields of 5% and you will see what savvy investors are lining up in droves to adopt this strategy. Are tenants hard to find? Many investors mistakenly think that the flats will be leased out to less than desirable tenants. This is not the case. there is high demand from single person households that want to live in suburban areas. Many tenants like the security of having someone else in an adjacent house - just to keep an eye on things. And as an investor you should always take out landlord insurance for extra peace of mind. Adrian came to us seeking to buy a positively geared investment property. He had pre-approved finance of $350,000 and was keen to invest. We sourced an off-market property for $220,000 that needed some minor cosmetic renovation work and with the granny flat Adrian has now ended up with a fabulous yield of just over 9%. Like anything in life you can do it yourself, or you can save money, time and stress and outsource to a professional. At propertybuyer, we can provide the complete turnkey solution for our clients. We have an excellent network of agent relationships to help source the right property (often before it hits the open market). We know the tricks of the trade to negotiate the lowest possible price and we know which blocks are most suitable for the granny flat strategy. We also have an excellent team of builders and have negotiated a bulk discount rate for our clients. Be careful of some companies that load up the cost of the granny flat and get paid secret commissions and kickbacks. Where 2011 finished quietly with a whimper, 2012 started like a flash bursting with energy. With interest rates relatively stable many investors are searching for the next deal. Subdividing and/or developing land has long been a successful strategy. Increasingly though adding a Granny Flat to improve the rent yield is gaining popularity. Smart property investors know that to maximise their gains they consult with their property tax specialists before committing themselves on a deal. They use property buyers agents to help locate the right properties, saving time & money and get negotiating support. Finally they use the right finance broker to source and help fund the deal for them. To find out more, join me and multiple award winners PropertyBuyer Rich Harvey and Broker Justin Doobov on Thursday 29th March as we share our knowledge with you. You are warmly invited to our next multi-speaker seminar "Property Subdivisions & Granny Flats". Some of what you will learn include? Can use a Granny Flat strategy in a Self Managed Super Fund? How to achieve sustainable yields of 9% to 10%? What is the outlook for property for the rest of the year? What opportunities are available for land subdivisions? Are the banks still lending? For subdivisions and Granny Flats? What are the terms being requested by lenders? What are the best type of loans to use .. and in which situations? Mortgage Insurance - at what price is it available- when is it demanded? How is profit on subdivisions taxed? Minimising tax - How should subdivisions be structured? When is a profit considered a capital gain accessing the 50% discount? When should you subdivide and sell and when is it better to subdivide develop and sell? GST - When is it necessary to register? When should you not register? Real life investor tax examples. If you have ever asked any of these questions then this seminar is for you! We will cover these meaty topics and more on the night. Bring your notepad, calculator and an open mind to learn. Maggie and Davyd were looking for a nice clean apartment in Sydney's Lower North Shore, close to CBD transport, shops and cafes. They were initially looking for a renovated 1-bedder or they were prepared to do some work if the right 2-bedder arose. After a 1-bedder of interest in Neutral Bay sold well in excess of my appraised value, we located a lovely 2 bedroom apartment in Mosman that needed minimal work and hence, we moved swiftly to secure it for them. Just wanted to say a huge thank you to Matt for finding our lovely unit. It is probably near to 30 years since we have purchased a property in the Sydney region and it seems the Sydney market is unique, not only massive but frenetic as well, with properties selling overnight in our recent experience. We would still be looking if it wasn't for you. Your "can-do" energy and expert knowledge got us the perfect property. Thank you for recommending that we even look at our unit. For some reason I'd noticed it on the internet but didn't think any more of it. And it is perfect for us. Just what we wanted. We would like to thank Melody as well, she was always very pleasant to talk to and most helpful. The Reserve Bank's (RBA) board met on Tuesday 6 March and decided to keep official interest rates on hold at 4.25%. Their media statement highlighted an expectation that the world economy is likely to grow at below trend pace however, the RBA don't foresee a deep downturn. Regarding Australia, the RBA sees the Australian Economy continuing to grow at close to trend rates (more on this later) and they expect inflation will remain between their 2% to 3% target band. The Bank stated that mortgage rates had risen slightly since the last meeting (with the banks moving variable mortgage rates independently of the RBA) however, bank lending rates remain at around average levels. The RBA also noted that although the housing market remains soft there had been some stabilisation in conditions towards the end of last year. Given the expectation that the economy would grow at close to trend and that inflation is forecast to remain in check, the RBA board felt there was no need to adjust monetary policy however, they did note that if conditions weakened there would be scope to provide further interest rate cuts. The day after the cash rate announcement the National Accounts results for the December 2011 quarter were released by the Australian Bureau of Statistics (ABS). The Gross Domestic Product (GDP) data for December 2011 showed that the economy is in fact growing well below trend levels. Over the quarter, GDP rose by 0.4% and over the year it was up 2.3%. Over the last 20 years, the average annual rate of economic growth has been recorded at 3.4% which indicates that the current pace of GDP growth is well below trend (and hasn't been above trend since the December 2007 quarter). The household savings ratio eased over the quarter to 9.0% on the back of improved consumer confidence, however households continue to save at much higher levels than they have done so over the past 24 years. Disposable income growth has also slowed, rising by 4.9% over the 2011 calendar year. The percentage of cleared auctions last week (54%) was the highest result since March last year. The improved clearance rate was on the back of 1,733 auctions, the largest number of auctions held over a week so far this year. The largest auction market in the country, Melbourne, recorded a clearance rate of 60.6%, which is also the strongest result since March last year. Sydney also saw clearance rates above 50% while all other cities saw more than half the auctions taken to market unsuccessful at auction.